The AHS Performance Horse Awards is a year-long high points competition for performance horses in ridden disciplines including endurance, racing, show jumping, eventing, ridden showing and dressage. Full points are awarded for affiliated competition, reduced points for unaffiliated. Bonus marks are awarded for each additional discipline. 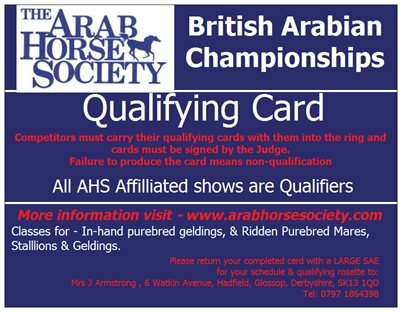 Entry is free to horses owned by members. The awards are in three sections, for pure Arab, part-Arabs and Anglo Arabs, with an Overall Junior winner. AHS Awards are also made to individual winners in each affiliated discipline, plus the best Veteran. Congratulations to the Champions and Top Ten finalists in the 2018 AHS Performance Horse Awards. Congratulations to the Top Ten in the three sections - Pure bred, part-bred and Anglo Arabs - and the High Points winners in each discipline. Gadebrook will also sponsor two new categories for 2014: Overall 'Best Veteran (16+)’; and Overall 'Rider with Most Points on different horses’. 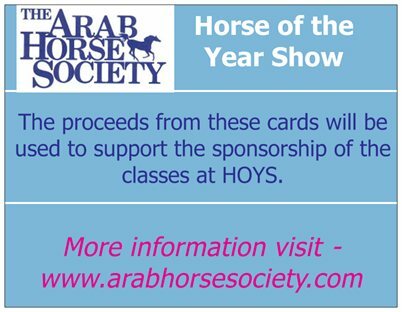 Sheer Versatility will sponsor a 2014 ‘Novice High points Endurance' award, with a £100 purse to the AHS member with a Novice endurance horse, 6 years old or older, which stays Novice all year. The owner wins £75 - with £25 extra of the rider is a member of EGB as well. 1st ELAYLA ch m 2006 by Nisar Ibn Estopa out of Elegance by Aurabba. 2nd SHAKMARI GOLD ch g 2004 by Mareschal out of Shakira Gold by Golden Cavalier. Bred by Mrs CB Pitt and owned by Mr & Mrs Adshead. Ridden by Lisa Adshead. 4th BINLEY PRINCE SALIM gr st 2005 by Prince Sadik out of Silvern Image by Masjid. Bred by Mrs Caroline Sussex and owned by Mrs Anne Brown. 5th SOVEREIGN br g 2002 by FL Sayawan (DE) out of Charala by Al Aswad. Bred by Mrs Joanne Lowe and owned and ridden by Carri Ann Dark. Bred by Mrs AW Potts and owned and ridden by Pat Guerin. Bengali D’Albret. Bred by HH Sheikh Mohammed Bin Rashid Al Maktoum. Owned by Ann Dark and ridden by Carri Ann Dark. 8th MARCUS AURELIUS ch st 2001 by Aurelian out of Fiesta Magica by Dargee Star. Bred by Mrs D R Whittome. Owned and ridden by Mrs Rowena Bertram, also Katherine Bertram, Gill Plumbley and Louise Scammel. Bred by Mr JC Hutchings and owned by Kay Curtis and ridden by Clare Wilson. 2nd LAGUNA FLAME b st 2004 by TP Starbuck (US) out of Mistral Whisper. 3rd RUBY SHY sk m 2003 by Puzzles Limited Edition out of Malibou Surfbreaker. Bred and owned by Alan Girdwood and ridden by Leanne Moir. 4th CAROUSEL DREAMING b m 2005 by TP Starbuck (US) out of Silver Frost. Bred by Mr A Girdwood and owned by Mr A Girdwood and Mr RK Pledger. ALAN GIRDWOOD – total: 1435 points on 3 horses! 5th BURFIELD RED DRAGON ch g 1998 by Courtside out of Garmon Cerise. Bred by Mrs BK Moss and owned by Victoria Free. 3rd Michelle Smith + SHAHIR NEESAAN ch g 2007 by Psyches Image R out of Sushi by Maleik El Kheil. Bred by Mrs NM Handley.